“Invitation is for a joint 30th anniversary party and vow renewal ceremony. Cover features embellished monogram layered with a wide satin ribbon. Inserts include special message and hand-drawn map with crystal embellishments as ‘keys’. 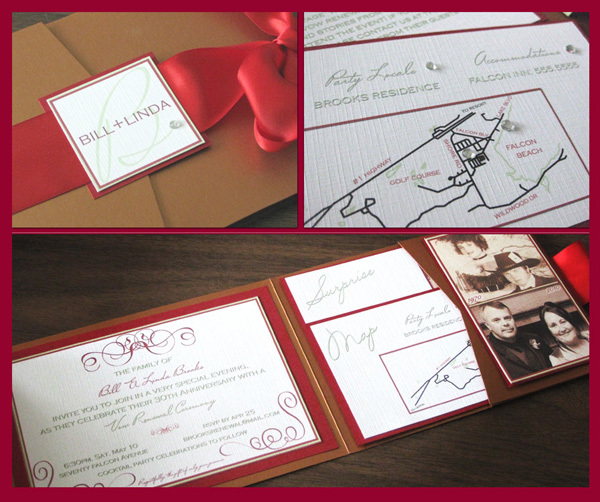 Also includes two photos of the couple (‘then and now’) on a side panel of the Pocket Invitation. I’m dying to know where the template for the invitation card came from! I NEED those scroll patterns!